Most homeowners shy away from using black countertops for fear of their kitchen becoming too dark and uninviting. This is no longer the case. 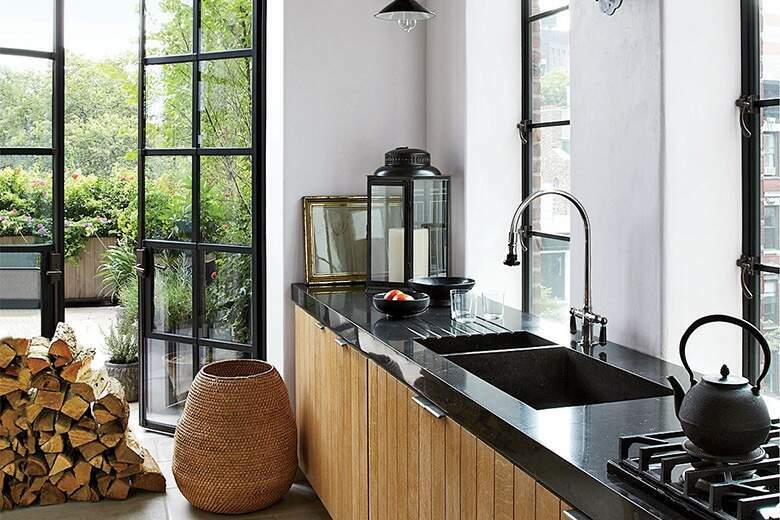 Here are 8 ways of using black countertops that will leave you with an envy-inspiring kitchen. Using black countertops doesn’t mean you have to pair it with white everything to avoid the room feeling too dark. Try using cream instead and pairing it with softened versions of your favorite colors to create a warm, inviting space. If you’ve got high ceilings and large windows, the rustic industrial look is within your reach. Pair solid black countertops, flat cabinets, light tiles and thin, industrial fixtures to achieve this exclusive look. If you’ve been looking to redesign your kitchen, you are no stranger to the modern kitchen design. Take this aesthetic one step further by combining stainless steel appliance and backsplash with solid black countertops and white custom cabinets. 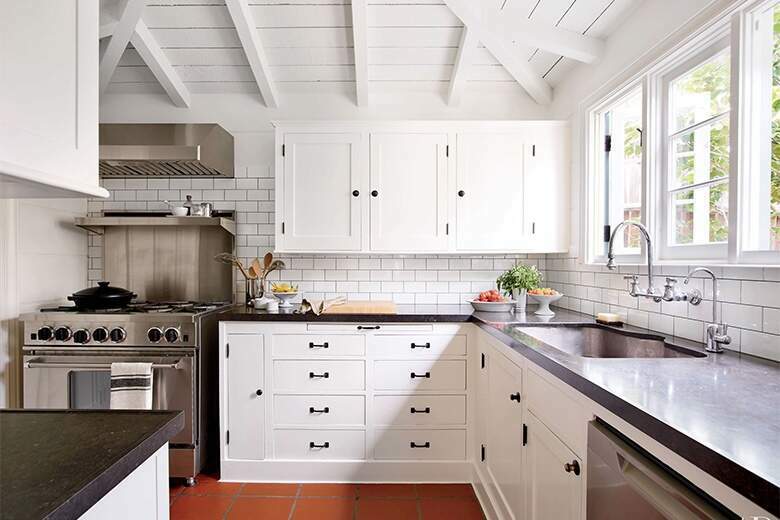 Use red floor tiles and a white subway tile backsplash with chef grade appliances, white cabinets, and black countertops to create a warm, country style kitchen that everyone would enjoy cooking in. Many people fear putting dark colors in small spaces. We’re here to tell you to fear no more. 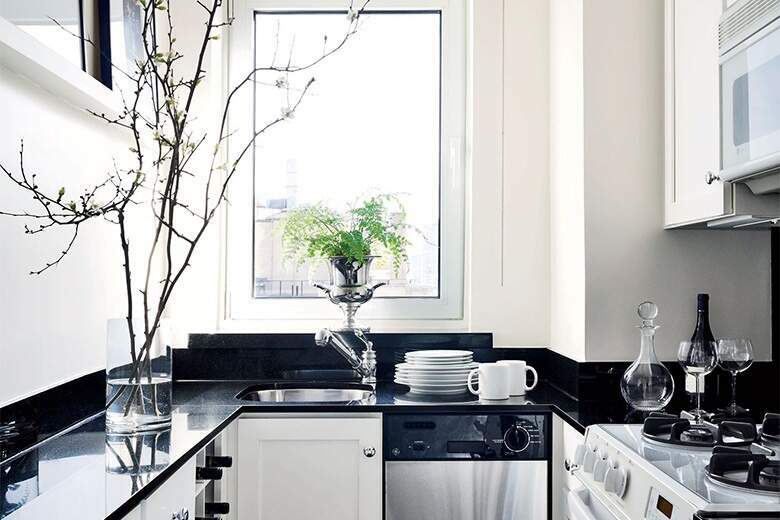 Combining black countertops with white cabinets, white and stainless steel appliances and white walls with clean detailing will leave you with a stylish, bright kitchen design regardless of square footage. 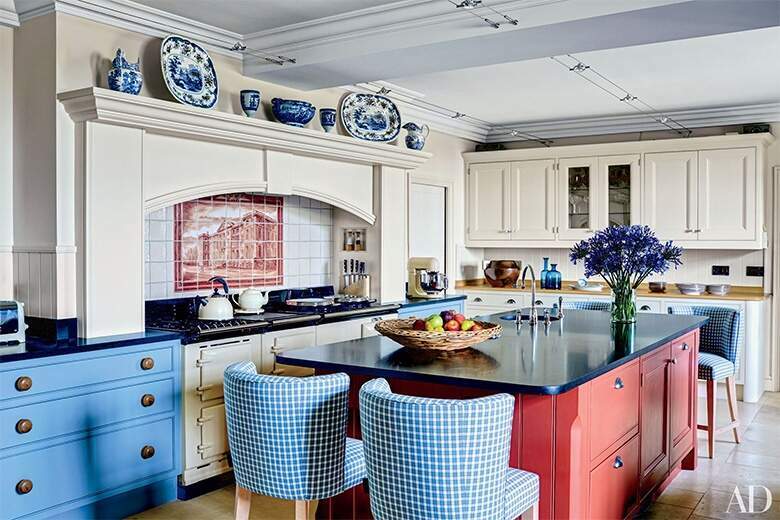 This style of kitchen is not reserved for celebrities. Feel like a star by combining black countertops with an ogee edging, white inset cabinets, and a white farmhouse sink to create this elegant look. 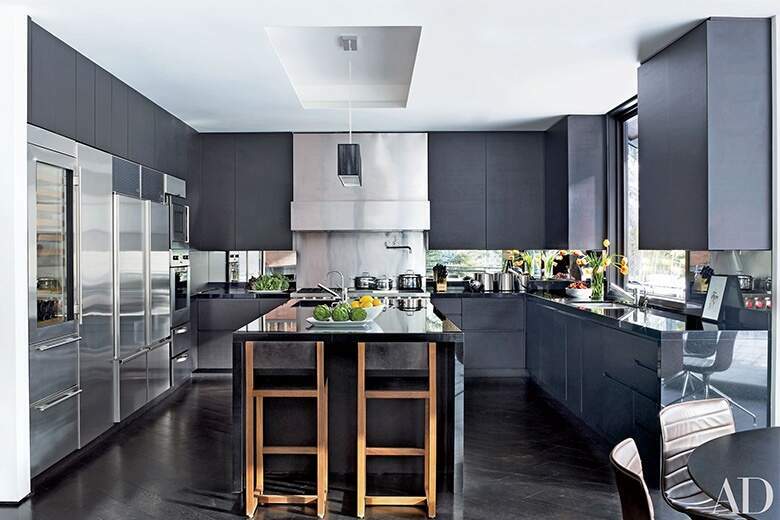 Believe it or not, black on black kitchen designs do not have to end up looking and feeling dark and depressing. If your kitchen is located in an area of your house that gets a lot of sunshine, take that opportunity to be bold with your kitchen design. Pair black flooring, cabinets and countertops with stainless steel appliances and mirrored backsplash to make that sunlight work to your advantage and create a beautiful kitchen that is sure to impress guests. When it comes to cooking, usually the older the recipe – the better the dish. Be bold by adding a fireplace to your kitchen and use black countertops, flooring, and tile work to give the space an old-world feeling. 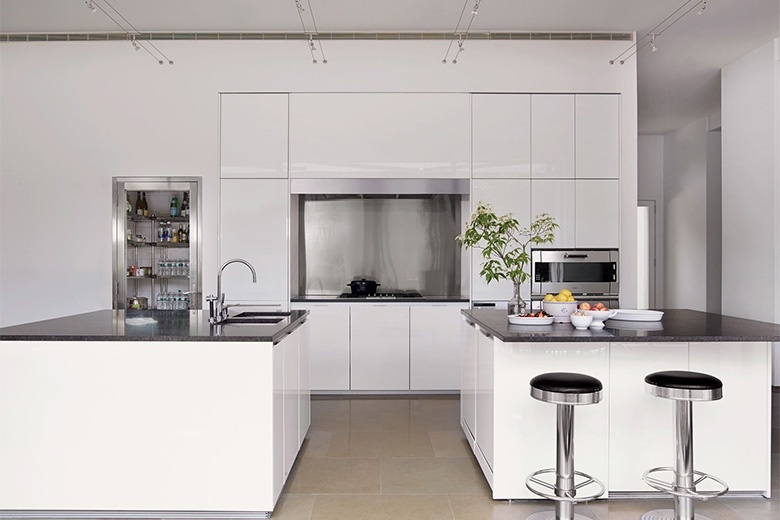 Are you looking to redesign your kitchen? Visit our specials page at GraniteSelection to get the best deals on Granite, Quartz, Travertine, Marble, and Quartzite.